Advertisement from the 1874 Bruce and Sons (New York) type catalog. (From scan by Mike Powers.) 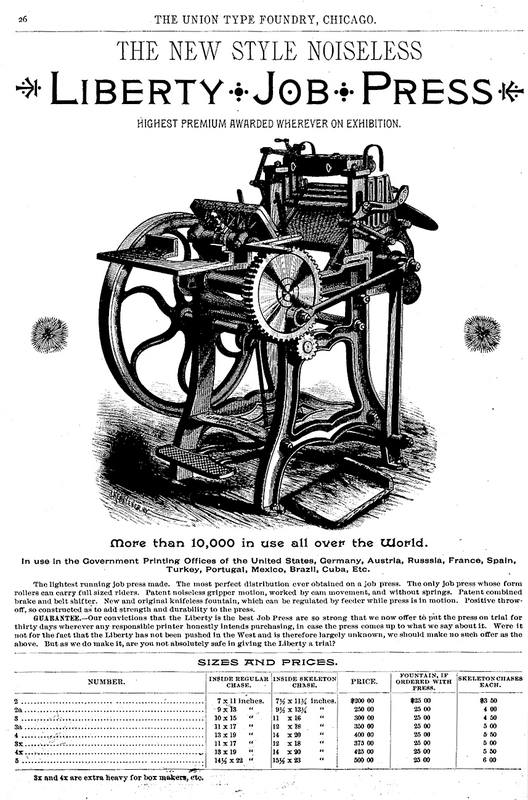 Advertisement from the September, 1887, issue of Inland Printer. 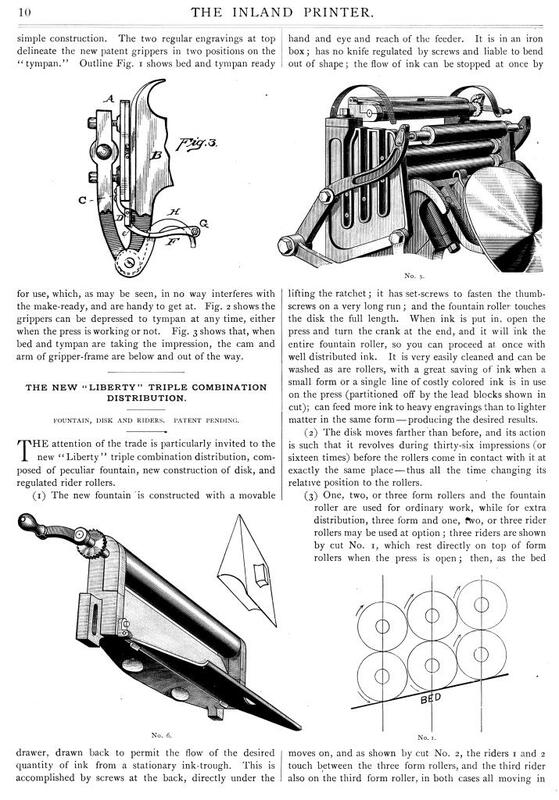 First page of an article about new features on the "noiseless" Liberty from the October, 1888, Inland Printer. 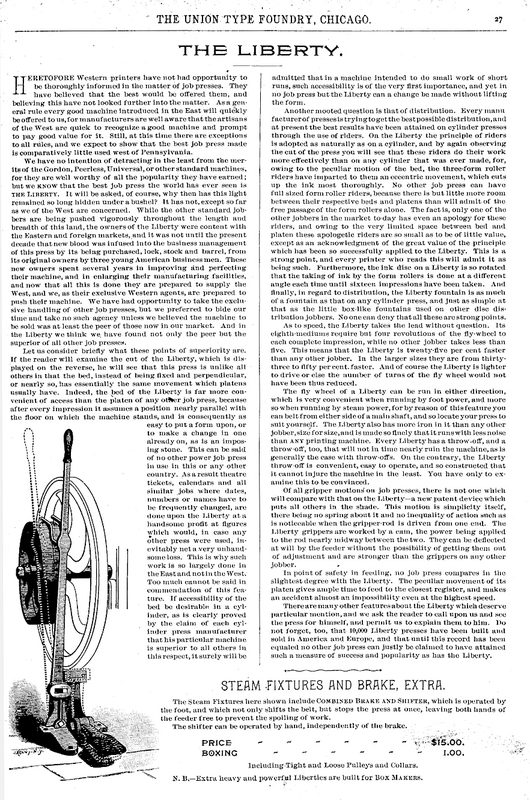 Second page of article from the October, 1888, Inland Printer. 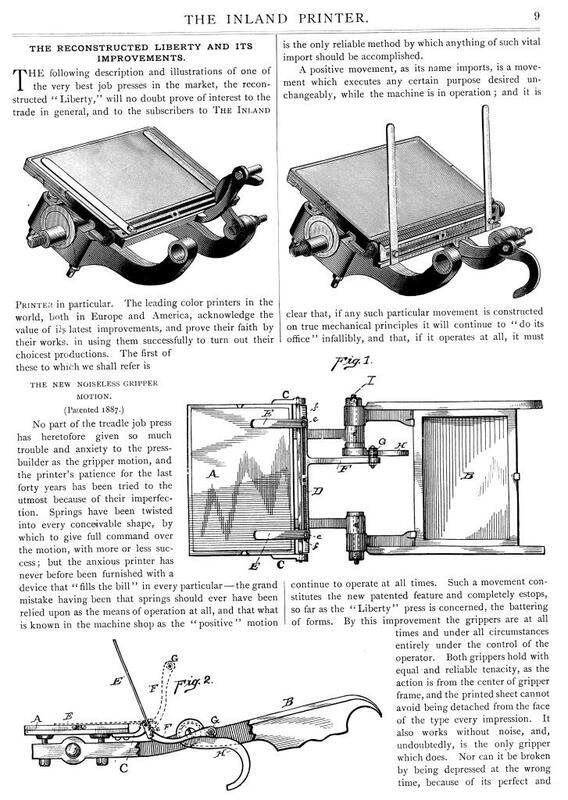 Third page of article from the October, 1888, Inland Printer. 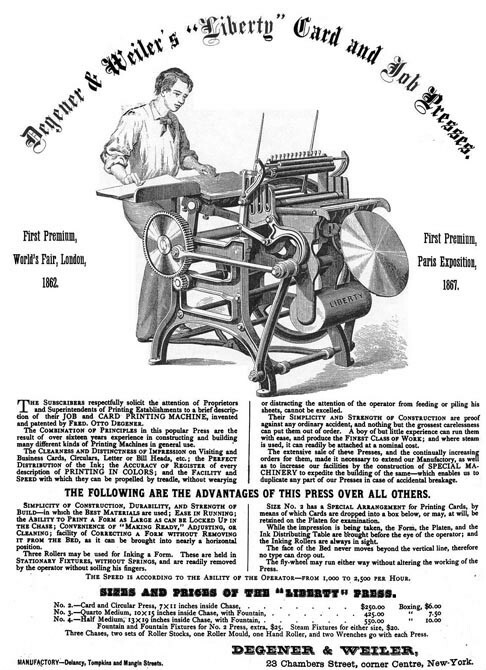 Last page of article from the October, 1888, Inland Printer. 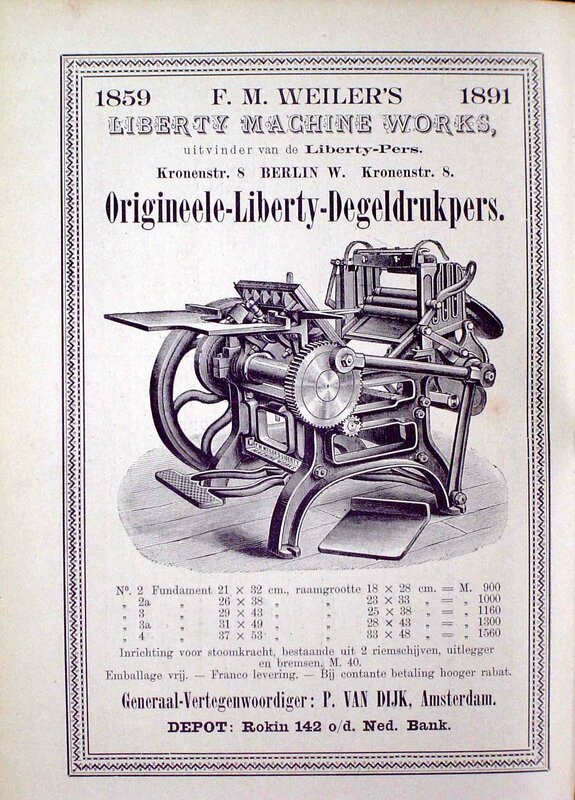 Herwig Kempenaers provided the following scans of European advertisements for Liberty (or Liberty-like) presses along with their descriptions. Click on the picture for a larger view. 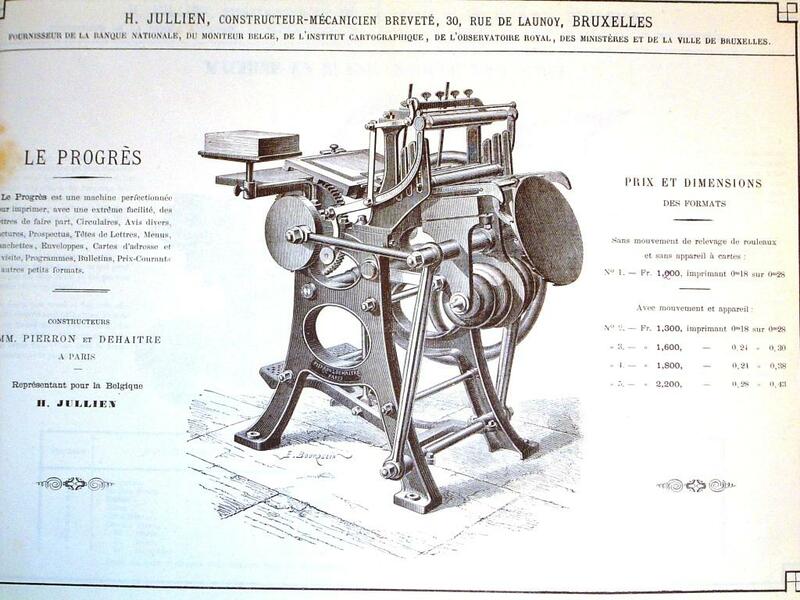 A page from the 1881 catalog of H. Jullien, a Belgian company. 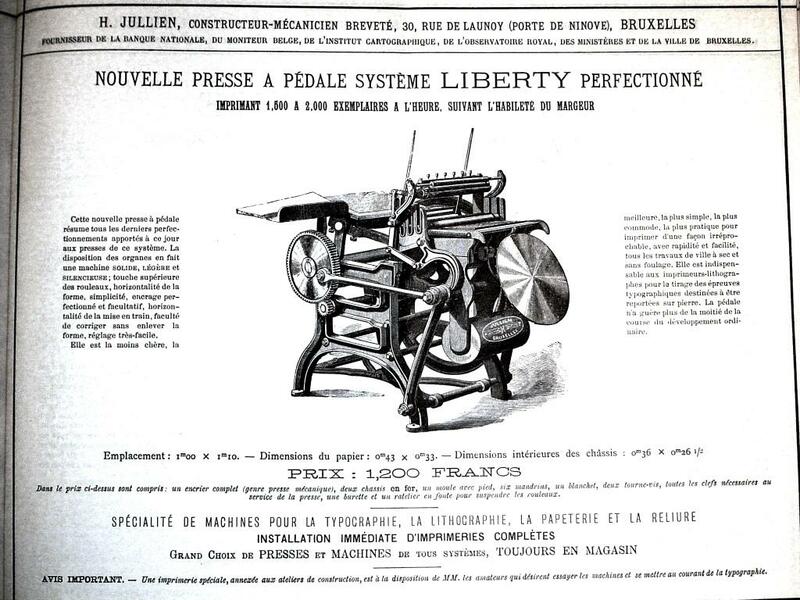 This Liberty look-alike, ``Le Progres,'' is from Pierron & Dehaitre of Paris, France. 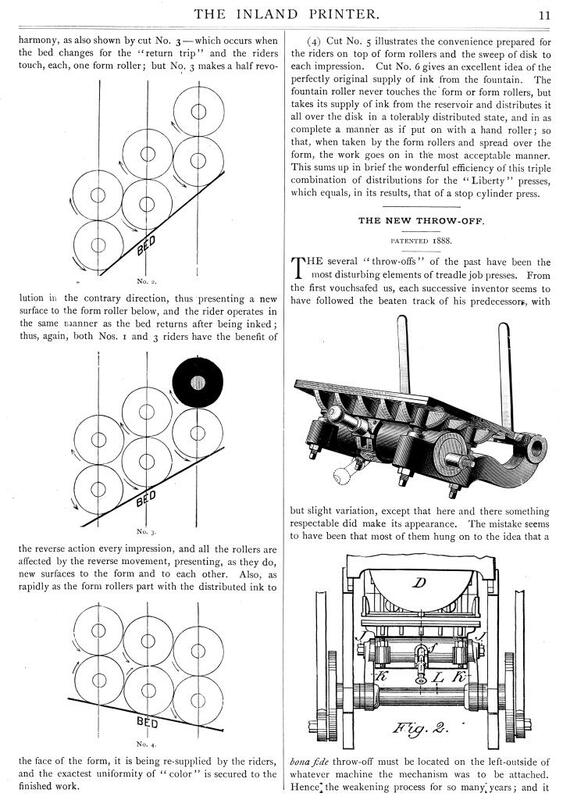 A page from the 1885 H. Jullien catalog. 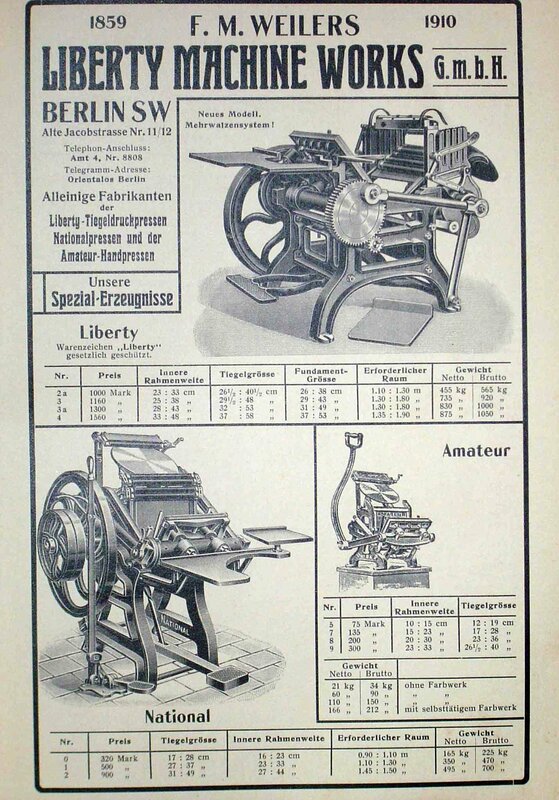 Although it's not labeled as a genuine Liberty, the picture looks like one used in earlier Degener & Weiler ads (except for the missing pressman and extra decoration on the counter-weight). 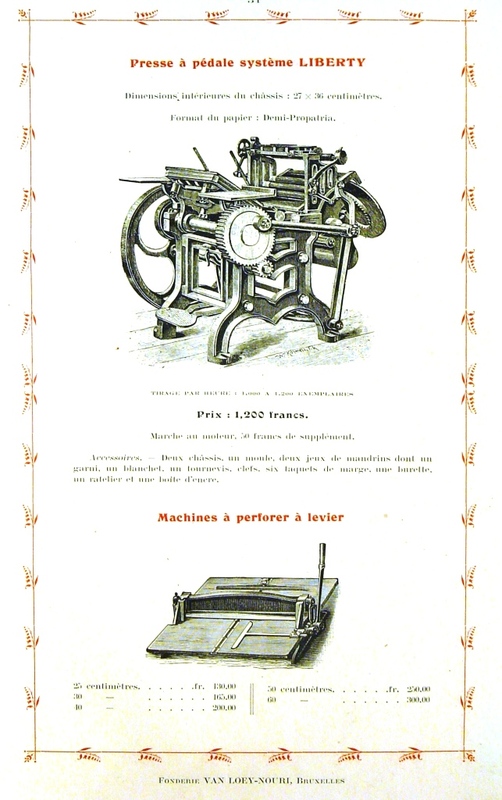 A page from the 1887 H. Jullien catalog. This Liberty knock-off is a different style from the one in the 1881 catalog. An advertisement in book of 1892 titled Het Boek in Onze Dagen ("The Book in Our Days"?) written by R. Van der Meulen. 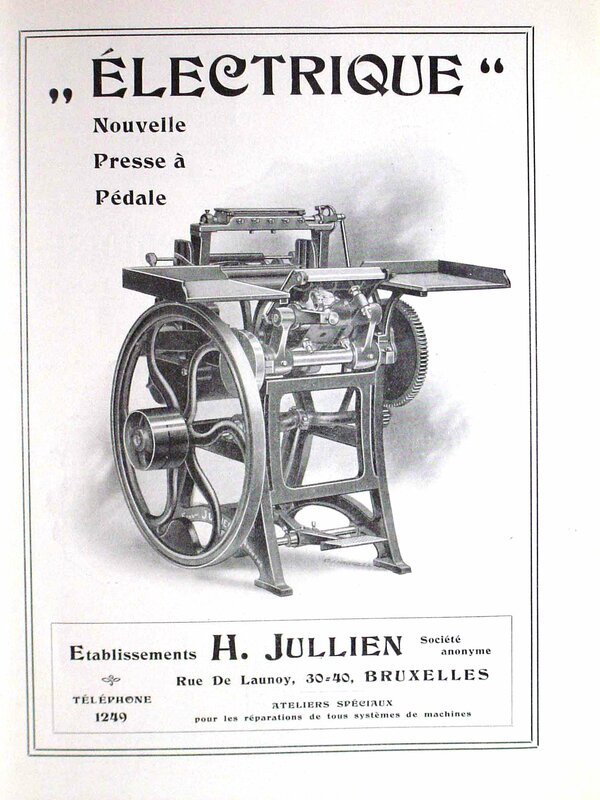 An ad out of the Belgian printing magazine les Annales de l'Imprimerie from January 1902. 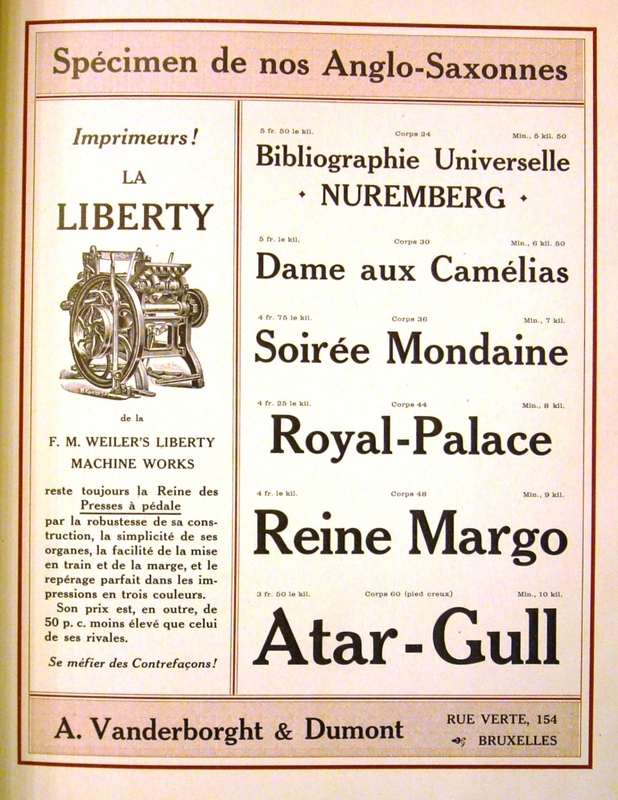 An ad from the August 1904 issue of les Annales de l'Imprimerie. 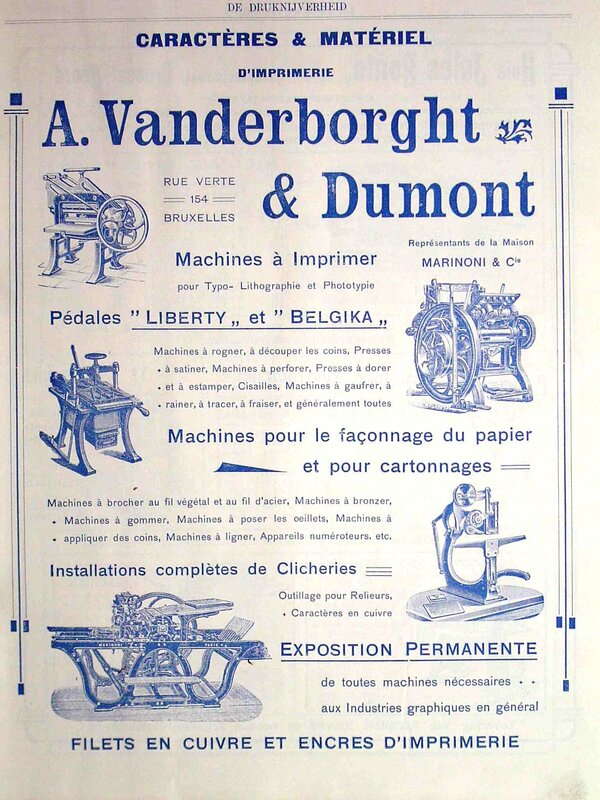 An ad out of a Belgian printing magazine, De Druknijverheid, dated March 1906. 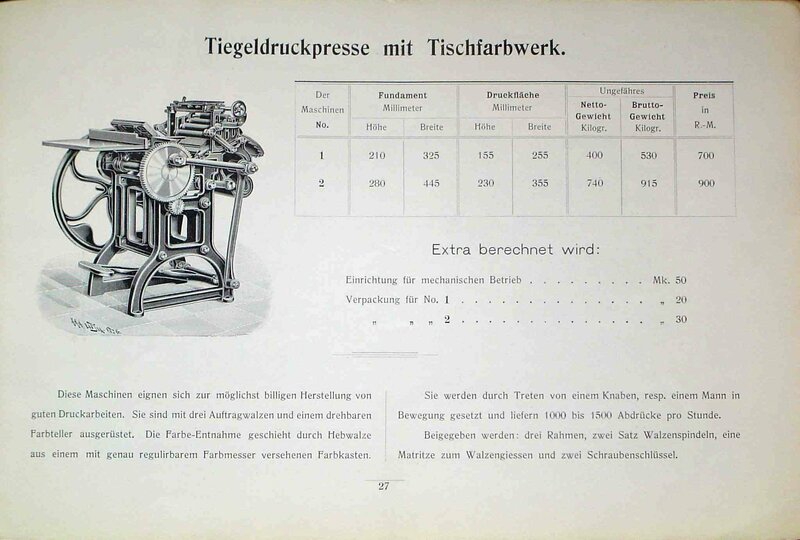 This 1910 ad comes from a German printing magazine, Typographische Jahrbücher. The text with the picture, "neues modell, mehrwalzensystem," means "new model, system with more rollers". Notice there are 5 ink rollers in the picture. 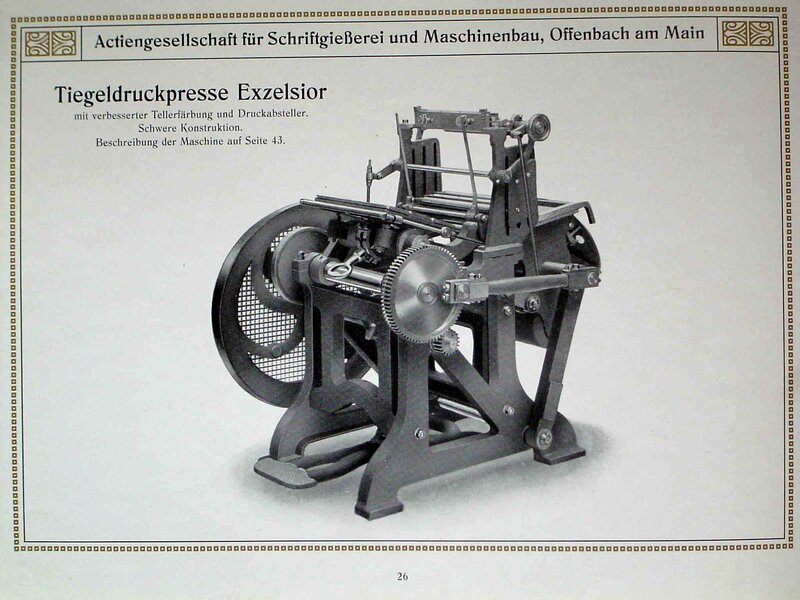 This scan comes from a 1902 catalogue of printing presses from the firm Bohn & Herber of Würzburg, Germany. 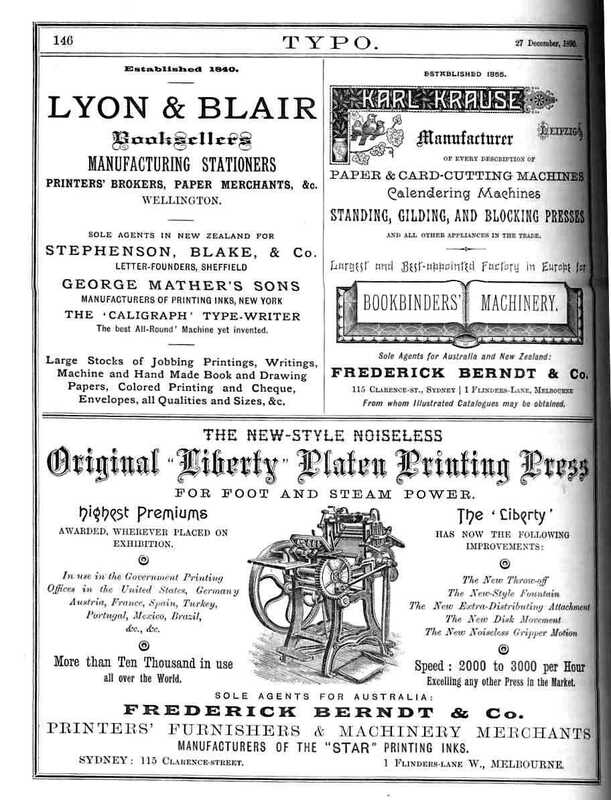 Another scan from the Bohn & Herber 1902 catalogue shows the "Frankonia" press, a significant redesign of the original Liberty. 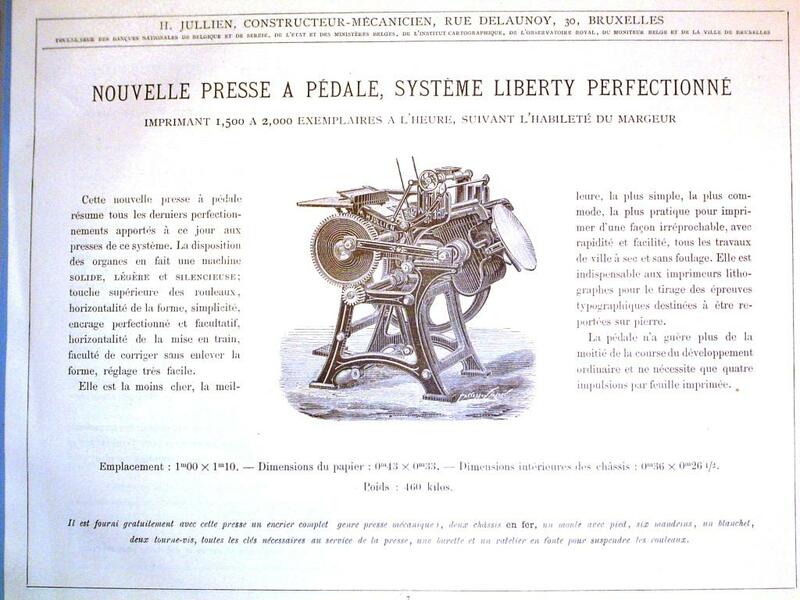 This non-Degener/Weiler ad is from the August 1904 issue of les Annales de l'Imprimerie. 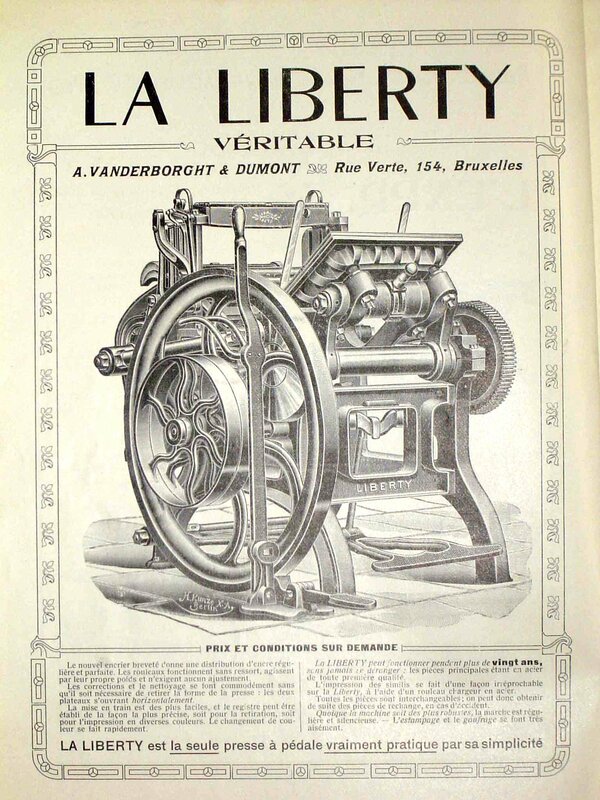 This Liberty look-alike press is shown in the 1905 Van Loey-Nouri catalog. 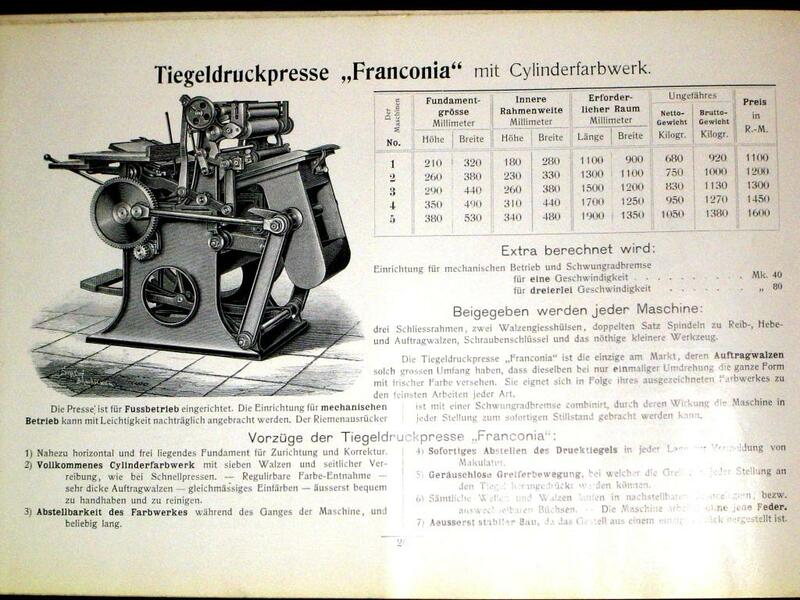 Taken from a catalogue of printing presses from the firm "actiengesellschaft für Schriftgiessereie und maschinenbau" of Offenbach am Main, Germany. The catalogue is from about 1910. 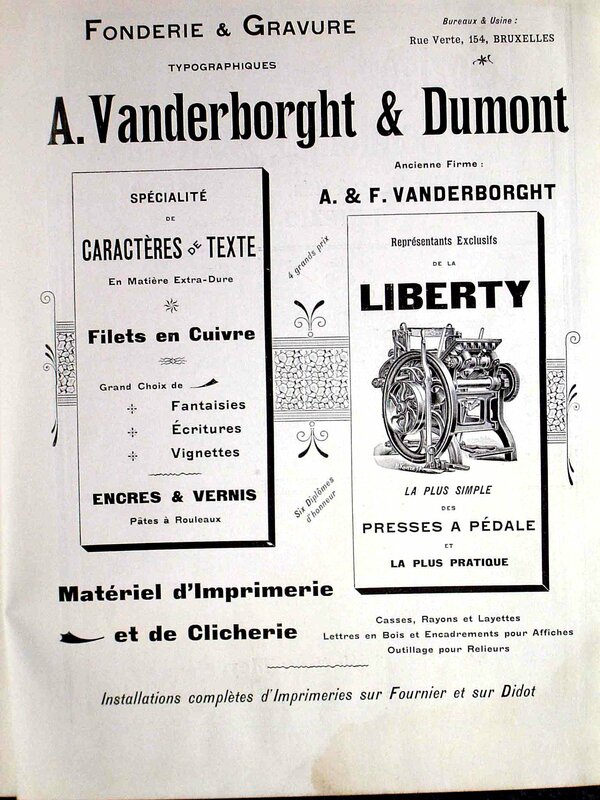 This A. Vanderborght & Dumont ad from 1910 shows a Liberty press manufactured by F.M. 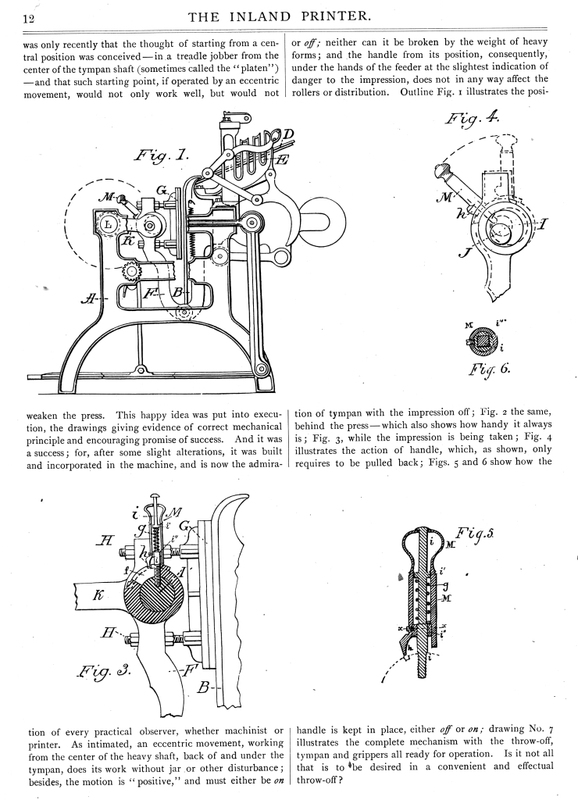 Weiler's Liberty Machine Works. 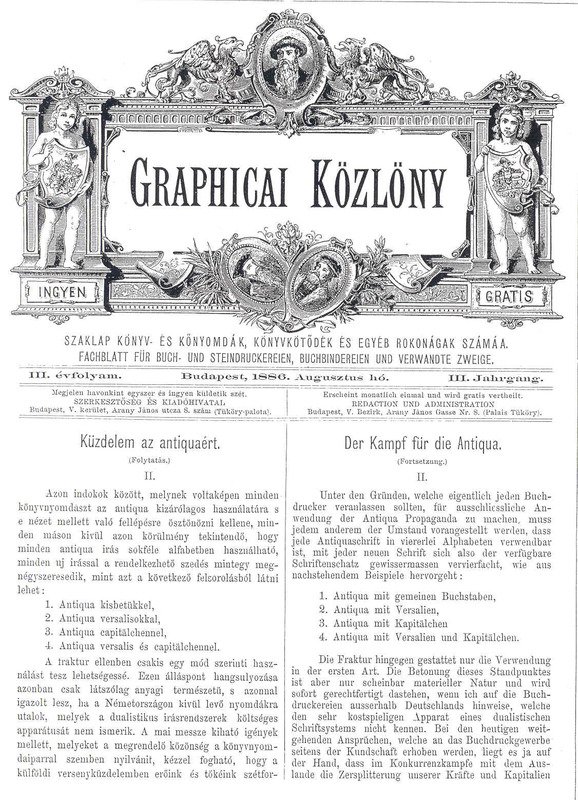 Title page from the August, 1886, (Volume 3) issue of Gaphicai Közlöny [Typography Journal] published in Budapest. Left column is Hungarian, right is German. Another page from the August, 1886, issue of Gaphicai Közlöny. 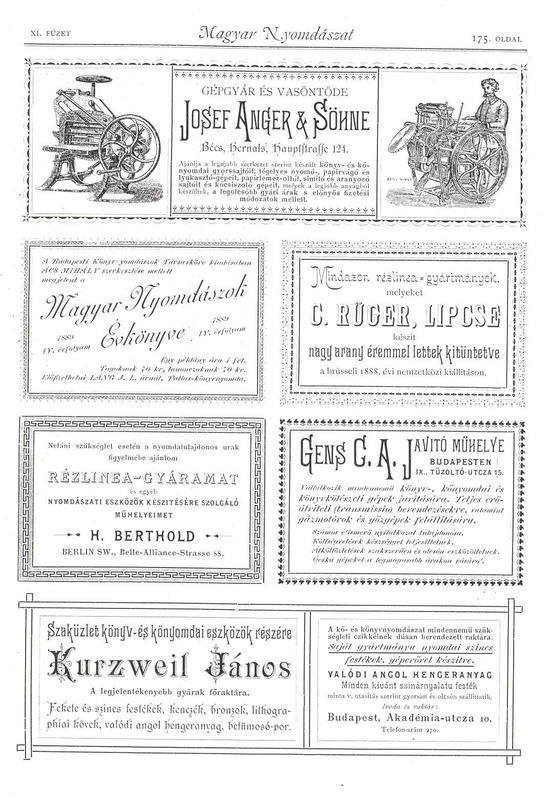 Page 1 of the Budapest publication Magyar Nyomdászat [Hungarian Printing] dated September, 1888; Volume 1, Number 7. 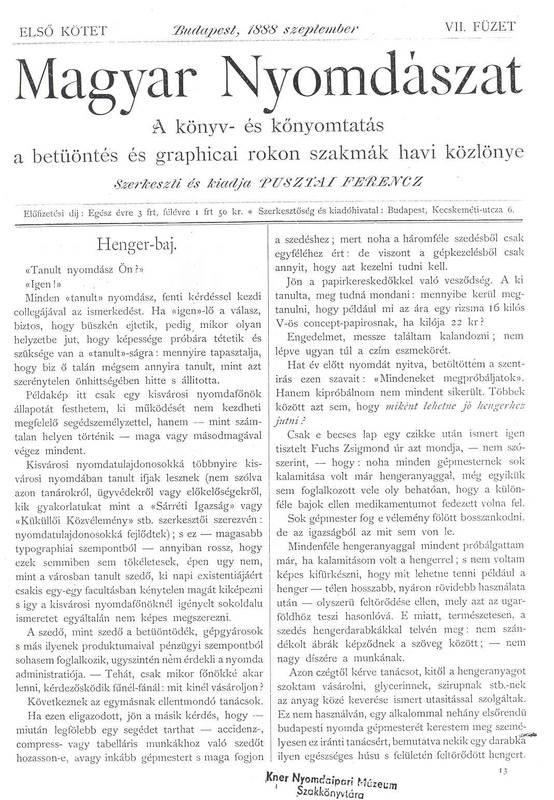 Page 103 from the September, 1888, Magyar Nyomdászat. 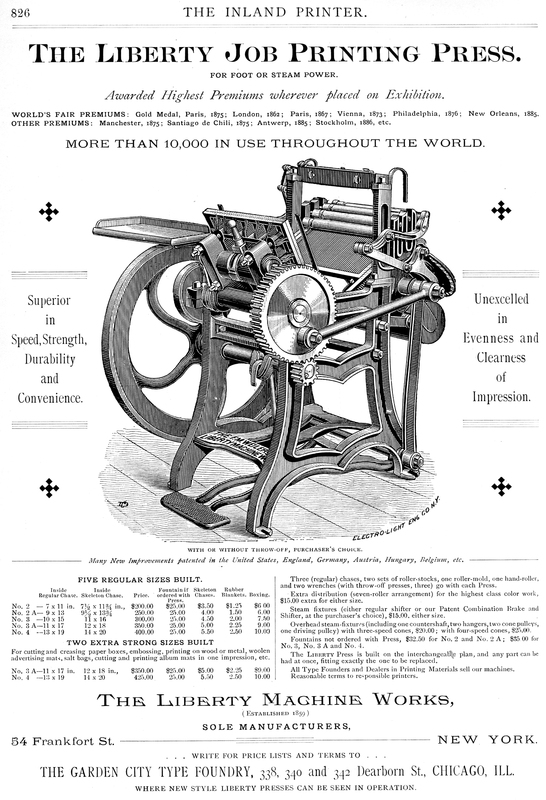 An advertisement for the J. 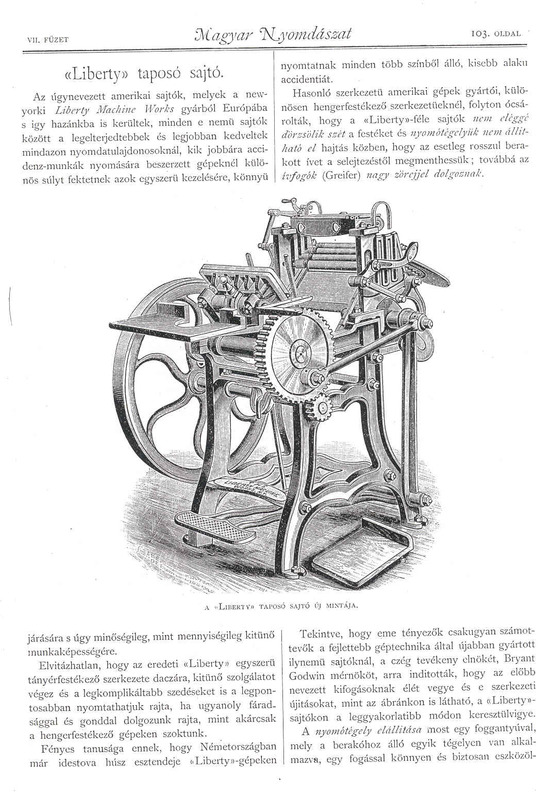 Anger & Sons Liberty press can be seen at the top of page 175 in the January, 1889, (Volume 1, Number 11) issue of Magyar Nyomdászat. 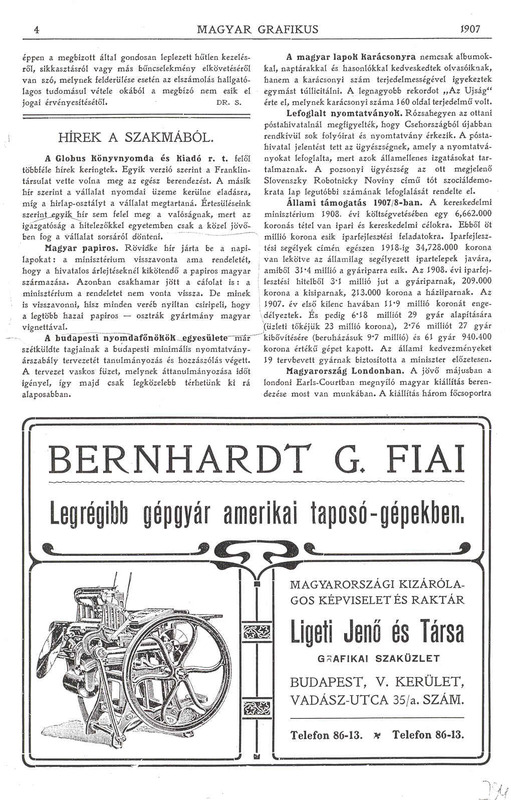 Advertising for the Liberty on page 4 of a 1907 Magyar Garfikus [Hungarian Graphic] published in Budapest. 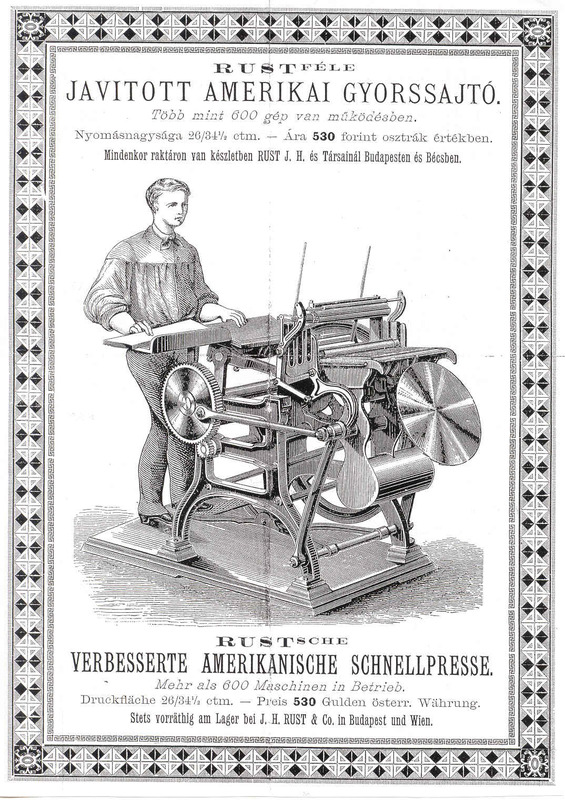 Machine factory: Bernhardt G. Sons; Representation in Hungary: Ligeti and Co., Budapest.